File photo dated 21-01-2018 of Gordon Banks during his speech at the Football Writers Association Tribute Night at The Savoy, London. John Walton/PA Wire. File photo dated 27-10-2015 of Former Stoke City goalkeeper Gordon Banks. David Davies/PA Wire. File photo dated 05-01-2016 of Former England and World Cup winning players (left to right) George Cohen, Gordon Banks, Martin Peters and Sir Geoff Hurst with the Jules Rimet trophy. Adam Davy/PA Wire. File photo dated 28-06-1966 of Leicester City goalkeeper Gordon Banks. PA Wire. File photo dated 12-05-2013 of Former Stoke City goalkeeper Gordon Banks holds the Jules Rimet trophy as he is awarded a a Stoke City shirt before the game. Clint Hughes/PA Wire. File photo dated 12-07-2008 of Former England goalkeeper Gordon Banks (centre) with Archbishop Desmond Tutu (left) and former Brazilian star Pele. Dave Thompson/PA Wire. 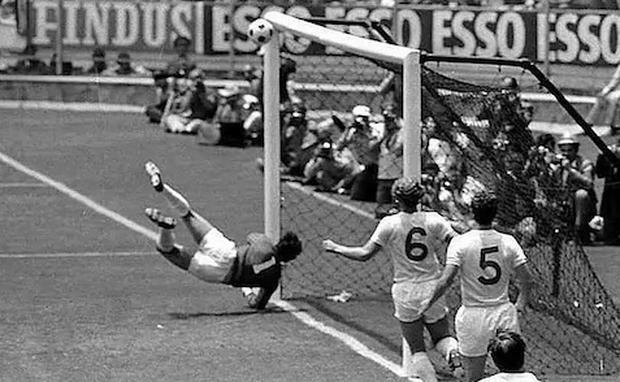 File photo dated 05-05-1965 of Gordon Banks jumps to make a save in the match with Hungary at Wembley. PA Wire. File photo dated 10-07-2008 of Former England goalkeeper Gordon Banks. Carl Court/PA Wire. File photo dated 04-03-2004 of Former International soccer players England goal keeper, Gordon Banks (left) with a picture of his famous save from Brazil striker Pele (right). Stefan Rousseau/PA Wire. File photo dated 12-07-2008 of Gordon Banks stands next to the new Gordon Banks statue at the Britannia Stadium. Dave Thompson/PA Wire. File photo dated 04-05-1972 of Gordon Banks, the Stoke and England goalkeeper after he received the Football Writers’ Association Footballer of the Year award for 1972. PA Wire. File photo dated 16-06-2004 of Model Nell McAndrew and 1966 World Cup England goalkeeper Gordon Banks at the unveiling of the new Butlins Redcoat ‘strip’. Yui Mok/PA Wire. File photo dated 30-07-1966 of the two teams line up before the match: (left to right) West Germany’s Horst-Dieter Hottges, Wolfgang Overath, Siggi Held, Helmut Haller, Wolfgang Weber, Lothar Emmerich, Willi Schulz, Franz Beckenbauer, Karl-Heinz Schnellinger, Hans Tilkowski and Uwe Seeler, linesman Tofik Bakhramov, referee Gottfried Dienst, linesman Karol Galba, England’s Bobby Moore, George Cohen, Alan Ball, Gordon Banks, Roger Hunt, Ray Wilson, Nobby Stiles, Bobby Charlton, Geoff Hurst, Martin Peters, Jack Charlton. PA Wire. File photo dated 14-02-1996 of Former England goalie Gordon Banks with his daughter Wendy in the goalmouth at Stoke City Football club after her marriage at the ground today to Shaun Beech. David Jones/PA Wire. File photo dated 04-05-1998 of Gordon Banks, a member of the ’66 World Cup Squad, with his young grandson, Edward Jervis. DAVE KENDALL/PA Wire. File photo dated 07-03-2001 of Ex-England goalkeeper Gordon Banks, holds his 1966 World Cup winner’s medal at a photocall at Christie’s South Kensington. Toby Melville/PA Wire. File photo dated 31-10-2000 of Former football player, Gordon Banks outside Wembley stadium. PRESS ASSOCIATION Photo. Rebecca Naden/PA Wire. File photo dated 24-05-1963 of Leicester City goalkeeper Gordon Banks reads a special edition of the London Evening Standard in the grounds of his team’s hotel on the day before the match. PA Wire.